So it’s only until this day that I finally throw a speech on this twice baked potatoes recipe. Though travelled with me from bashes to sprees, this thing has never failed to get me amused once. My first favorite thing about baked potatoes is that I can start preparing those potato casseroles even 3 months beforehand. The next thing I know is wrapping them in freezer bags, then pull them out, let thaw, stuff with the filling and put to bake. Things are just ready right when I’m in the mood. So this just means you don’t have to wait until you have time, potatoes will always let you have your time. It also goes oh so well in fetes, blowouts, BBQs and potlucks. What more can people ask, honestly. Are baked potatoes – or ‘anything’ potatoes – a good carb source? Good carbs are basically defined as foods which provide much vitamins, minerals and fiber within its content. So here’s one good news: potatoes do meet these demands. A whole range of B vitamins and of course – folate and potassium – are found rich in one single medium-sized potato. According to the USDA, one baked potato with skin-on even delivers 3.8g fiber, which takes up to 10% of recommended daily intake. Absorbing fiber is literally the best way to preserve fullness longer and lower cholesterol level. Keeping the skin on is also one brilliant way to prevent losing its nutrients during cooking. If you are so desperately getting away from fat and cholesterol, go for potatoes. But please be noted that potatoes don’t always act this same way. It still depends on how they’re processed and at what amount they’re consumed. While fiber is super helpful in managing blood sugar levels, potato’s being an rapidly digested starch, on the other hand, can actually affect negatively on it. So please be careful and pay attention to your portion if at all possible. 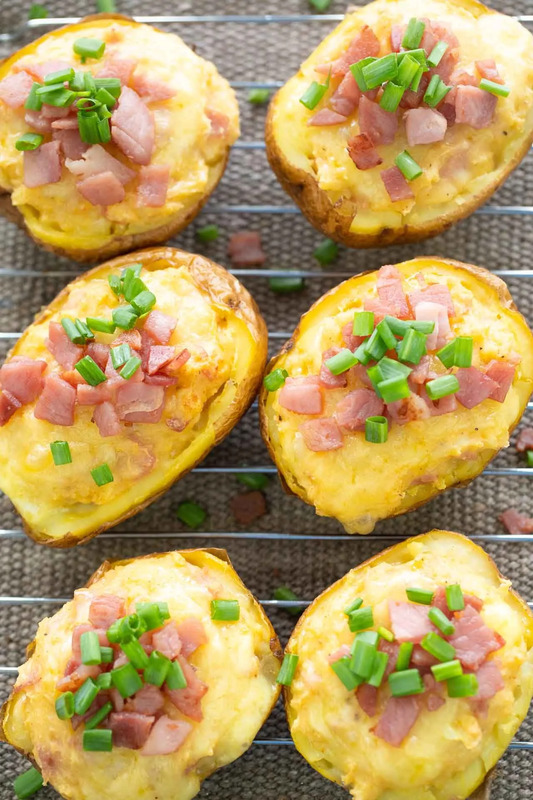 Especially when served with cream, cheese and butter (like this twice baked potato actually does), it is highly advised for diabetics to only take small possible bites. I’ve heard people talk crispy on this thing, but oh dear lord, baked potato is just a whole starchy-but-soft, earthy-but-velvety bunch, people. Propped up by goodies altogether, it’s even hard not to be a bless. Like, how come not – for something stuffed with all those sour cream, whole milk, cheddar cheese, butter and bacon like this? The brilliant thing is, any combination, mash and mix for the filling is sure a combination on its own. As much creamy and fluffy as people are ofttimes disposed towards twice baked potatoes, adding more cream will be a favourable deed. It goes the same with the remaining ingredients. A whole variety of cheese or more bacon will always be welcomed, if there’s any chance mayhap. Side dish options also open out another range. Some pan-roasted chicken, pork tenderloin or turkey pieces are at front lines when it comes to side serves. And not just this thing alone. Mashed, whipped, fried, baked – you name it. Last but foremost, toppings – my downfall. Of course it’s been enough of a dainty to win over any cheesy buff up till now, but it occurs to me that some extra sprinkles at the last minute can not do any harm either. On the exact inverse, to be honest. A typical classic-bro range of choices should fall in with more cheese threads, small-chopped bacon strands, green onions or chives. Some others might go upgraded with more greens, small scoops of guacamole, crumbles of tortilla chips or pickled jalapeño. Anyhow, get fancy your own ways. I must say, people I’ve known at my place seem to never resist twice baked potatoes once they’ve come to their credits. Brush raw potatoes over with olive oil or melted butter, use a fork to prick them on the skins to prevent exploding later, then wrap them all in foil. Make the filling: Add butter, sour cream, milk, salt, garlic powder, pepper, paprika, onion powder, 1/4 cup cheddar cheese and 2 slices crumbled bacon in a large mixing. Mash with spoon or potato masher until they’re well combined but not too smooth. Line your wrapped potatoes on the baking sheet. Put to bake for an hour, or simply until the skin is merely dry and a bit wrinkle. Then remove and let cool to room temperature. Reduce the oven to 350F for the second bake. Cut each baked potato in half vertically. Scoop out all the inside of them, only leave a thin inner line of approximately 0.2 inch together with the skin. Scoop the filling into the potato shells and fill just full. Top these bowls with the remaining cheddar cheese before putting back to bake for another 25-minute. One easy way to check their doneness is to slightly squeeze them. If it’s all nice and soft, then you’re ready to go. After removed from the oven, sprinkle them with bacon crumbles and chopped chives. Enjoy while still hot.